Some premium cars these days come with actual three-prong power outlets that let you plug in just about anything from a laptop to a vacuum. Unlike the cigarette lighter power ports we’re used to seeing in cars, these outlets pump out the same 110V AC power that any wall outlet in your house does. Of course, they’re still very uncommon in cars, useful though they may be, so we found an awesome little accessory that puts not one but two standard three-prong outlets in any car. 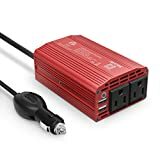 Check out the BESTEK 300W Power Inverter, which is just $25 on Amazon and worth every penny.